Please click here to access further information. The Strengthening Families Programme runs over seven weeks and supports families in strengthening their relationships with each other. Parents and young people meet in separate groups for the first hour, and then come together in the second hour for a family session. The group is led by a group of people from a variety of different agencies and backgrounds, who already work with young people and their families. These can be accessed by clicking here. Please click here to access the programme and other important information relating to this event. 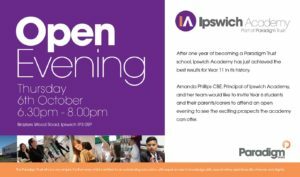 Ipswich Academy has been shown to be making strong improvement following its most recent visit from Ofsted. The inspector, who visited the school from 5th – 6th July 2016, agreed with findings from a previous inspection in February 2016 that, “leaders and managers are taking effective action towards the removal of special measures”. 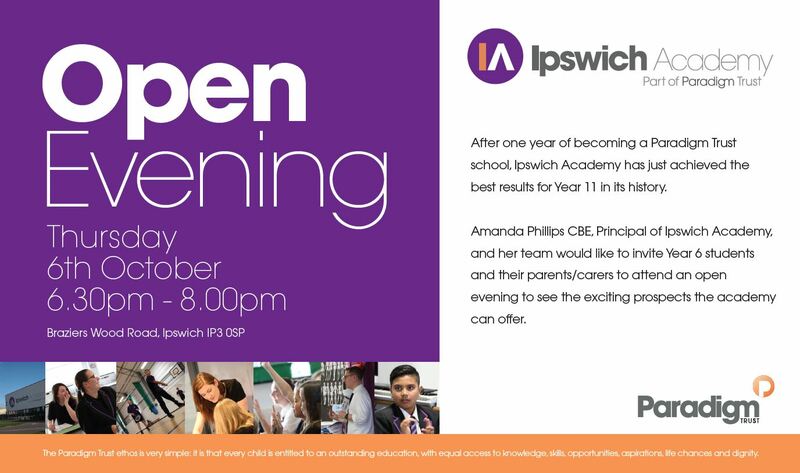 Paradigm Trust took over the running of Ipswich Academy in September 2015. This inspection report states that since that point, “The executive principal continues to provide the school with a strong steer for its improvement. She and her team of senior leaders have maintained their efforts to raise expectations and embed the improvements noted at the time of the last monitoring report”. The report also notes that “actions to raise achievement have been directed towards all pupils” while “greater rigour has been added to the assessment of pupil progress in all years”. Additionally, new initiatives introduced by the school “are being used effectively with individuals and in small groups to boost their confidence and competence”. Whilst the report details key areas for improvement in order to raise all standards at the school, it also highlights that Paradigm Trust ensures that the school’s “plans are routinely checked to gauge the rate of improvement, and identify where further action is needed”, while the expectations of teachers “remain high”. The latest inspection report can be viewed here. Welcome back! Welcome for Y7 students who are joining us! We look forward to welcoming students tomorrow – Monday. Students to arrive by 8:55am. Y7 to enter via main reception and we will show you the way to the hall for a welcome assembly.